Members of the Hurffville Elementary School Future Acts Club pose in front of tables of donated Halloween candy. Sugar fueled the early-morning energy level of members of the Hurffville Elementary School’s Future Acts club on Nov. 7, though none of the student-volunteers actually consumed any. 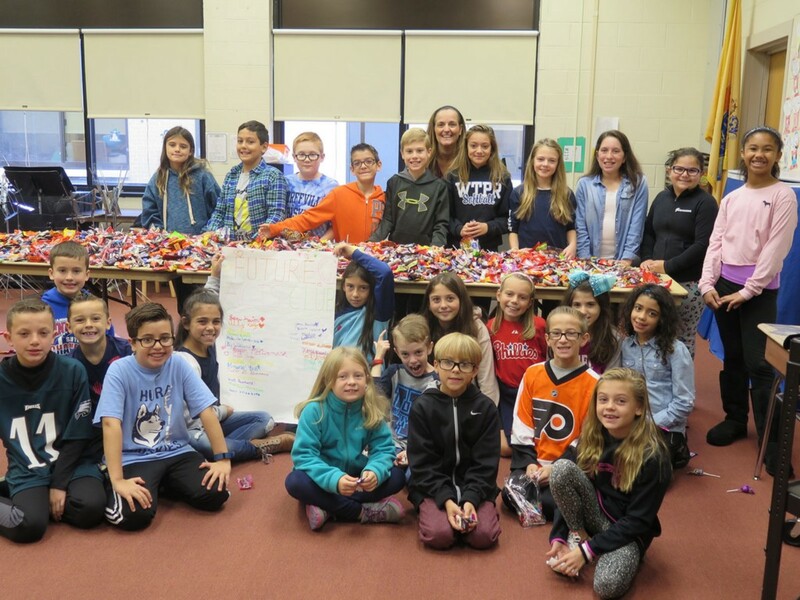 Instead, the third-, fourth- and fifth-graders found themselves up to their elbows in Halloween candy that had been donated back to the school following obviously impressive trick-or-treating hauls. The students worked together to create individually packaged candy treat bags. In their first community-service project of the year, the students shared sentiments about kindness in handcrafted notes and included them in the bags. Working in conjunction with the Changing Our World Project at Washington Township High School and the middle schools’ Future Acts clubs, the bags will be distributed throughout the community to Ronald McDonald Houses, hospitals, veterans’ homes, senior centers and social service programs. The efforts are being duplicated in all six of the district’s elementary schools. The goal of the project was to receive more than 1,000 pounds of donated candy, enough to fill at least 3,000 bags for area recipients. If Hurffville is any indication, the project will be a sweet success.